Xiaomi-backed wearables brand Huami’s Amazfit Stratos is a multi-sport GPS watch with some features of smartwatches. It’s swim-proof, can track outdoor runs, shows you notifications from your smartphone, lets you store music, and promises up to five days of battery life. All this comes at a price tag of Rs. 15,999, which is a pretty good price if it all works well. We used the Amazfit Stratos for a week to find out whether it’s worth considering as a “smart” watch for fitness enthusiasts. 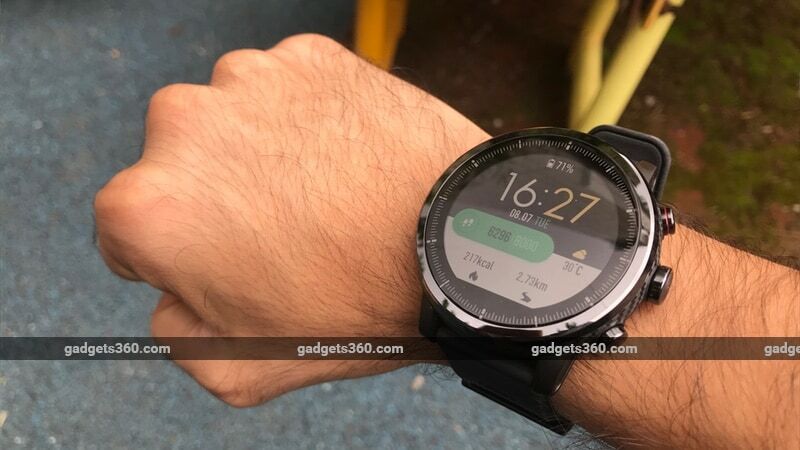 The Amazfit Stratos looks stunning in photos but the actual product isn’t as good-looking. It’s really bulky, with a thick circular dial and large buttons. While we appreciate the large display, it looks a bit like a flat tyre and isn’t a full circle. The Amazfit Stratos is a bit too bulky to be comfortable for everyday use. It uses a silicone strap and we found that it fit securely and didn't cause any additional discomfort. The display is perhaps the biggest weakness of the Amazfit Stratos. It’s an always-on display, which is great, but the positives end there. The glass on top is very reflective, and under bright light, it is hard to read what’s on screen. The backlight tended to hurt our eyes in dim rooms because it lights up the entire screen. With the Amazfit Stratos, waking up in the middle of the night to check the time on our wrist was a painful experience every single time. Even though it has some cool watch faces, the display isn’t good enough to show them off. One big design flaw with the Amazfit Stratos is its charger. The charging cradle snaps on to the bottom of the watch, but it can fit upside down just as easily. If you accidentally get it wrong, you won’t be able to charge the watch because the pins won’t make contact. While the mechanism works just fine, this oversight could be rather annoying in the long run. The Amazfit Stratos is compatible with iOS and Android, and you’ll need to download the Amazfit Watch app on your smartphone. The app allowed us to choose to sign in with an existing Xiaomi account, and we tried this first because we had created one when reviewing the Xiaomi Mi Band 2. However, it just did not work, so we had to create a new account. The pairing process was smooth and we found the app to be well-designed. It shows data in neat graphs and you can see historical data quite easily too. Our issue with the app is that it doesn’t do much. It has a setting to change units from Imperial to Metric, but that change didn’t reflect on the watch. We had to do this from the watch’s settings. Similarly, options such as auto-upload data, 12- or 24-hour clocks, do not disturb mode, etc. can only be changed on the watch. The Amazfit Stratos uses a proprietary operating system, which is quite common in the fitness segment. Companies such as Garmin and TomTom do the same thing. It takes some time to get used to the interface of the Amazfit Stratos, though. It has a touchscreen, and three buttons for you to navigate through the UI. Press the top one to scroll up, and the bottom button to scroll down, and if you want to select an option, you can use the middle button. The app shows a tutorial to take you through other actions, such as long-pressing the top button to go back, etc. but this is not intuitive at all. We also noticed that the touchscreen only works if you “wake” the watch by pressing one of the buttons. If you try to use the touchscreen after it’s been idle for some time, it remains unresponsive. These are minor annoyances that add up to make the overall experience feel clunky. However, the watch does show notifications and lets you read full messages even from third-party apps. You can’t reply to any notifications as this watch is meant to be a fitness wearable with notifications, and not a proper smartwatch. While we found the notifications useful, people who need more control might not. We can live with an average UI if the Amazfit Stratos does its job from a fitness standpoint. To test this, we ran it through some standard tests. The first is to test the step counter by walking 1,000 steps and counting them manually. Then we checked if the Amazfit Stratos recorded them accurately. The results were surprisingly good — the Stratos recorded 1,002 steps when we counted 1,000. Our second test was to check if the GPS of the watch was accurate. We first drove a car through a route near our office in Mumbai to establish a 1-km distance as our test track. This route took us under a flyover as we wanted to see if the watch can trace the route accurately. We ran the test with the Apple Watch Series 2 on our left hand and the Amazfit Stratos on our right. The Stratos took three minutes to lock on to a signal in an open space on the main road, which was frustrating. Our Apple Watch found a GPS signal instantly (as it uses a paired iPhone’s GPS when). Most running watches take around two minutes to find a GPS signal, and three minutes is a bit too long. Then, the Stratos recorded the 1km distance as 1.64km. The Apple Watch had no such issues and it showed the route to be exactly 1km long. When we looked at the route recorded by the Amazfit Stratos, it had marked a start point far from where we had actually begun recording the walk, but once we took a U-turn under the flyover, the Stratos corrected itself. We tried this test a second time, just to check whether the same error was repeated. On this attempt, it took one minute to lock on to a GPS signal at the same spot, which was good to note. The Amazfit Stratos had a much better showing, but it still wasn’t entirely accurate. On the second try it recorded 1.11km on the 1km route, and its starting point was slightly off. Overall, this kind of inconsistency is worrying, because we’d always be second-guessing whether the Stratos’ tracking is accurate. We also noticed that the Amazfit Stratos doesn’t have a dedicated tracking mode for strength training or gym sessions, or for other activities such as Pilates and yoga, which are found on several other fitness-oriented wearables. Given that, we used the elliptical training mode to track a 90-minute gym session, and found that the heart rate sensor on the Stratos didn’t do a great job. When we looked at our heart rate during the session, the Stratos always showed a value that was either too low or too high based on how we were feeling at that point. A look at the data later confirmed this. The Apple Watch showed our maximum heart rate during the session as 191 beats per minute, while the Stratos’ data said this was 175bpm. It was a strenous session during which we felt like we’d fully exerted ourself, and our maximum heart rate definitely should’ve been higher. We could also see the heart rate data peaking at different times on the two watches, and felt that the Apple Watch’s data was more accurate. Sleep tracking with the Amazfit Stratos was a bit of a mixed bag. We compared its data against what was recorded on the Apple Watch by the excellent Sleep++ app, and found that it was accurate sometimes but not at other times. One day we’d set an alarm for 5.30am and we woke up but went back to sleep. On that day, the Stratos claims that we woke up around 5.30am, whereas the Apple Watch data suggested that we woke up at 7.40am. The latter is closer to reality. When we managed to sleep uninterrupted at night, the data was fairly accurate. We like the fact that the battery life of the Amazfit Stratos is around five days. Without using GPS, it lasted almost seven days on a single charge. The moment you start tracking workouts using GPS, the battery starts to drain more quickly. It’s worth mentioning that by default, features that could drain power - such as automatically uploading workout data - are disabled. Finally, we really missed automatic workout tracking feature on the Amazfit Stratos. We did forgot to manually begin a workout on one occasion, and the Stratos didn’t log it for us. With companies such as Fitbit adding this feature to their products, and Apple announcing it with watchOS 5, it would be nice to see this feature come to the Amazfit Stratos as well. We were unable to go for a swim during the testing period, but we did subject it to a shower multiple times and it continued to work just fine. 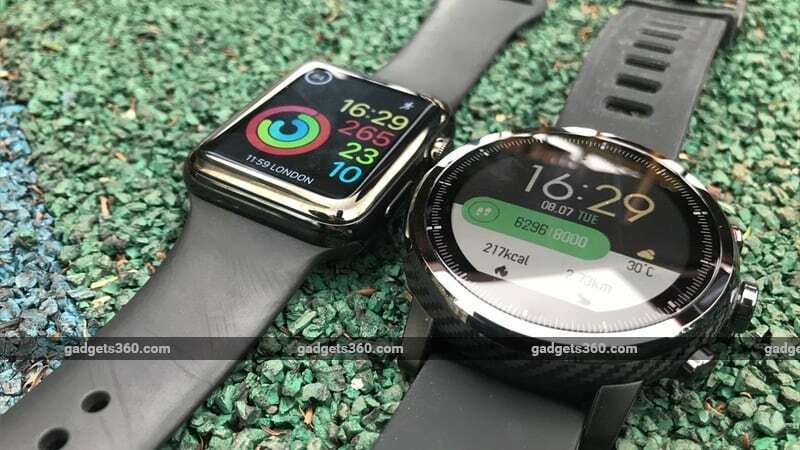 The Amazfit Stratos looks great on paper but fails to live up to its promise in many ways. We really like the idea of a fitness-focused wearable that shows notifications and looks like a cool everyday watch, but the Stratos’ implementation of many features leaves a lot to be desired. Its bulk makes it uncomfortable to wear every day, and its decidedly masculine styling means that women aren’t likely to find it appealing. While we think that it could work as a multi-sport watch under ideal conditions, the Amazfit Stratos' inconsistent performance means that we hesitate to recommend it over products from established brands such as Garmin, TomTom, and even the Apple Watch, which isn't strictly direct competition for the product. The pricing — Rs. 15,999 — is great for the features offered, but we still think the TomTom Spark would be a better choice for fitness enthusiasts on a budget. Those who can afford an Apple Watch Series 3 would be better served by it. 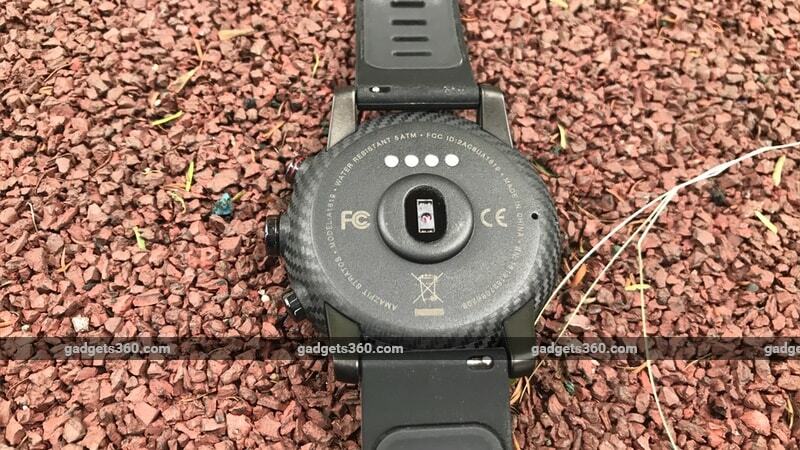 Update, 31 August 2018: Following the publication of our review, Amazfit sent us a second unit so we could check whether the first one was buggy. This unit was much better at locking on to GPS signals in multiple areas, but it still struggled at the spot we used for our GPS test. This unit recorded a 1km distance as 1.2km, which isn’t good at all. To be completely certain, we used the replacement unit on a 10km run at the Airtel Hyderabad Marathon 2018. This time, it recorded the distance as 10.2km. A deviation of 200m over 10km is acceptable (the best running watches out there can be up to 100m off over the same distance), but we should note that the course was almost entirely in open areas with only one 100m section where we were under a bridge. Overall, this kind of inconsistency is worrying. Serious athletes would always be second-guessing whether the Stratos’s reports are accurate. Our repeated tests lead us to the conclusion that the Stratos’s GPS tracking might work well in ideal conditions, but it struggles in crowded localities in big cities. Based on our new findings, we have changed one of the ‘Cons’ from ‘Inaccurate GPS tracking’ to ‘Inconsistent GPS tracking’ and updated the ‘Tracking accuracy’ score from 2.5 to 3.
product The Amazfit Stratos is a multi-sport fitness watch with notifications. Is it a good pick for athletes? Read our review to find out.